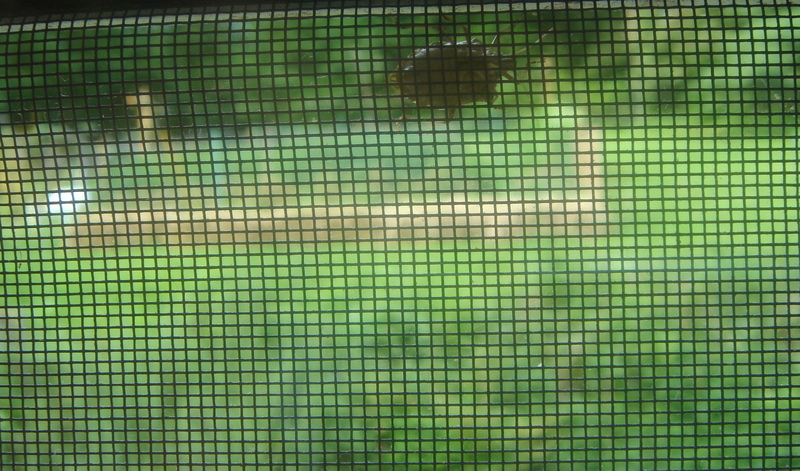 I’m sitting here watching a stink bug crawl across the window screen. It grabbed my attention just as I was thinking about time. The different qualities of time. Times that speed by. Times that don’t. Thinking how months and years seem to be moving faster. Remembering summer days as a kid. Months between one school year ending and another beginning stretching on forever. And so I’m watching this stink bug. It’s not in much of a hurry but it clearly has something to teach me. My scalp is starting to do the funny thing it does when this sort of thing happens. I have a hunch what this demo is about but I’m going to really sit with this one because I sense that it is important. And I don’t want to trivialize the message. 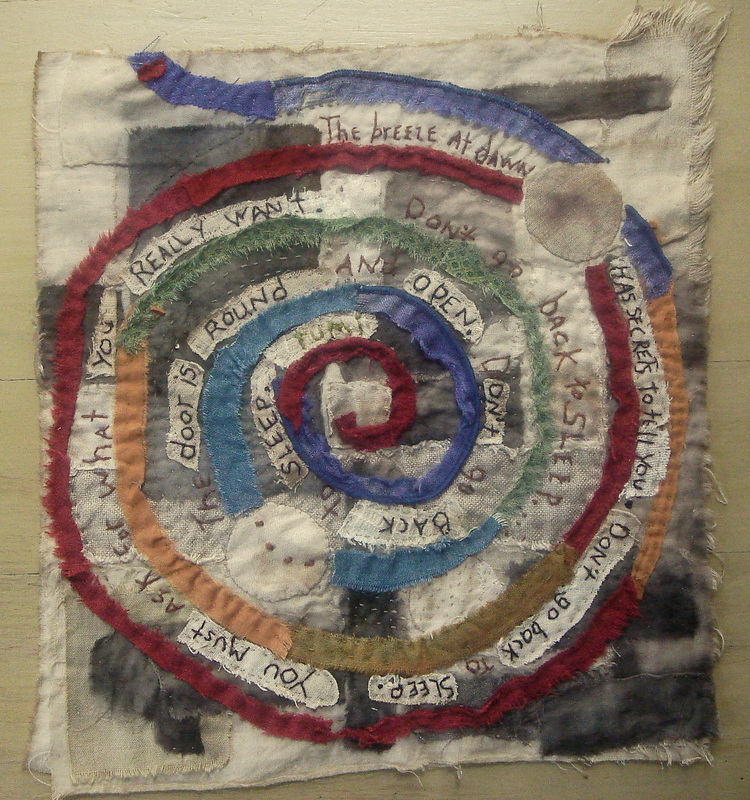 But besides just the quality of time’s speed, I’ve also been thinking about its structure. And before I go any further, I need to clarify this. When I say “thinking,” I don’t mean I sit around for hours or even minutes at a time really pondering time. I simply mean thoughts about time run across the ticker tape periodically. There they are, and then they’re gone. But still, time has been somewhat of a theme lately. And about the structure of time, I’ve been wondering–is it linear? is it circular? is it some other structure outside of our habituated 3-dimensional perspective? I think so. Yes. I think it is some thing else. But like the stink bug’s message, it eludes me. Teases me. Feathers my nose. Does that thing to my scalp. So yes, I was surprised to see it’s been two weeks since I last posted. Two weeks of intense shepherding of the grandchild variety. All summer, actually, but much more so this past bit. And today school started. So. This is what I want to show. The morphing of cloth. A project that started out with potential. Earth tones from black walnut and the pinks– Amma roses. Maybe I should have stopped there. Maybe it was finished. But it didn’t feel like it was. and then… Then it stalled out. Completely. And waited and waited and waited. Until a Rumi quote came to me. I wasn’t looking for it but clearly needed to have it. And it seemed the cloth needed it as well. and a step is missing. The way the cloth looked before the entire thing went back into the black walnut vat. That’s the missing step. And the black walnut bath–made the words almost impossible to read. Darkened things up way more than I wanted. It seemed unredeemable. Ruined. The cloth barely escaped scissors several times. Shuffled around the work room looking for a landing spot and ended up wadded in the corner. Very sad. Both of us. In person it’s better. The walnut stain is more pronounced. The colors are more vivid. The purple is really intense–not blue. But overall, this is what happened. The story of one cloth’s journey. It reminds me of my own life. The changes. A consistent underlying direction perhaps–but the unimaginable changes. And I think it’s o.k. hi Nancy. mornings usually the first thing i do is take a peek at whatever i was working on the night before. 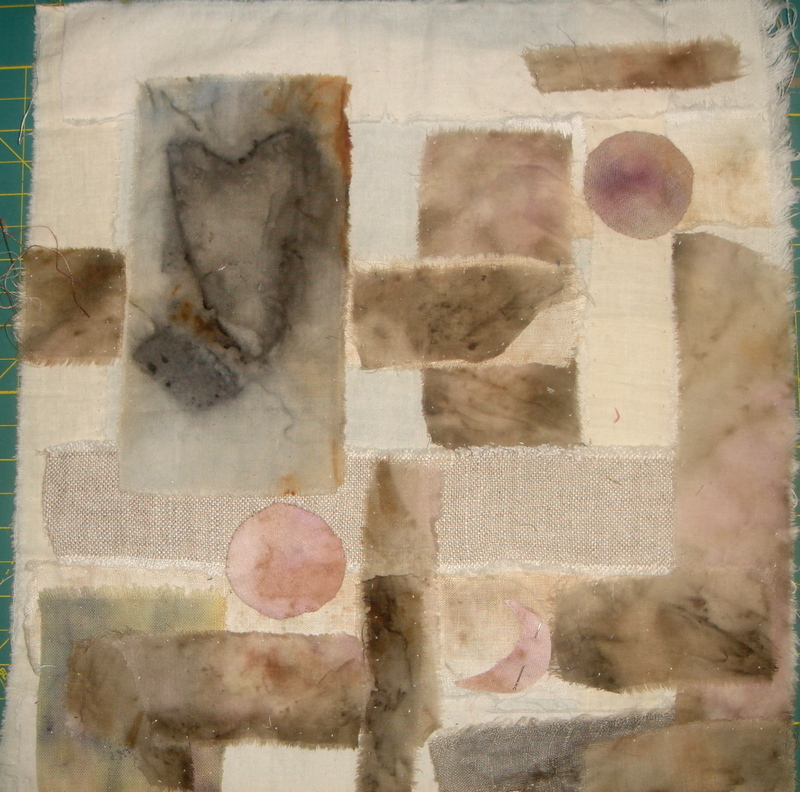 this piece is still pinned on the wall, awaiting final stitches. sun hasn’t appeared yet so everything is a bit darker–a lot darker. and creating another stink bug moment for me. the idea of how awareness fades in and out. recedes. come forward. the rhythm of that. and i’m wondering, is the darkness necessary? and i guess it is. a resting place. awareness, fading in, fading out…yes. and yes. 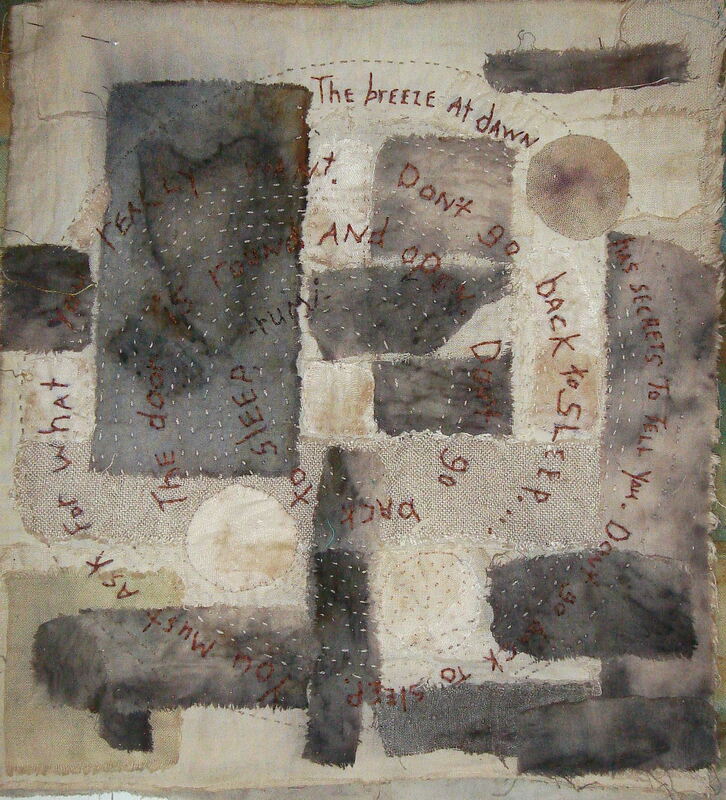 roses and flows into….don’t go back to sleep. i just love that gentle admonition. love it a lot. hi Grace. here you are. the flow of awareness is so interesting to me. now it’s happening. now it isn’t. and that’s when i remember the “gentle admonition. glad you were here. hi Debbie. glad you’re here. and appreciate your comment. just tried to visit your blog but couldn’t get past gravatar. any suggestions? 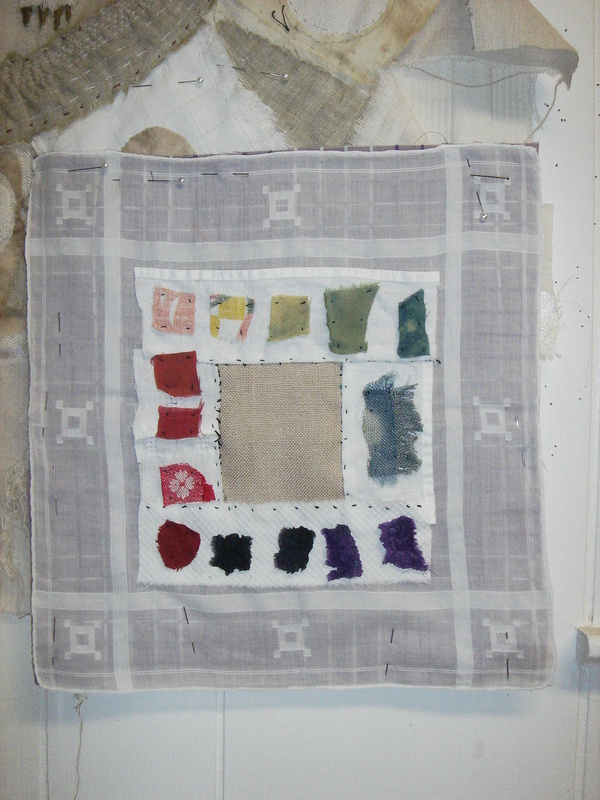 love the simplicity of your colour palette on the hankie Patricia! the hankie could really have been a cloth of its very own. now that i look at in from this perspective. always the questions, when is less more? and is suppose the answer varies with each moment. to me it seemes that you arrange your cloth so lighthanded .. in a dreamy way . I admire that a lot. hi Doris. so good to hear from you here. i just checked out your blob and so moved by the helper for your grandson–and the blog creatures. they’re wonder full. thanks for sharing. love to read about the making of this piece in more detail… when something seems irredeemable and comes back to life, it is all the more appreciated, don’t you think? or carries more depth? your thoughts about time resonate… watching one child leave the nest, the next preparing, it all seems to have gone so fast, and yet when I read journals from the toddler years, there were so many times when it went so slowly! it’s true–the appreciation of the seemingly irredeemable. like the phoenix. i’ve been following your journey with sons on your blog. it is that time, already. and yet where does all that time go. i ask because i wonder about things like this. is it still here? somewhere?